Leather Colorado Foundation produces contests for Mr Leather Colorado, Mr Colorado Rubber, Colorado Bootblack, Ms Leather Colorado, and Miss Leather Colorado. The oldest of these contests, Mr Leather Colorado, was first held in 1980 and is the second longest running leather contest in the US, second only to International Mr Leather. The other contests have been added over the years to include the interests of other people within our community. The winning contestants represent Colorado at national and international contests. 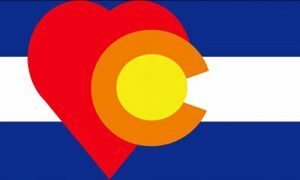 The Leather Colorado Foundation created the Colorado Leather Flag, the only state leather pride flag within the US. The flag is a combination of the international Leather Pride Flag and the Colorado State Flag. Each titleholder identifies a charity to work with during their title year. The Foundation and titleholders host various fundraisers throughout the year to raise money for them to attend their contests and to benefit their chosen charity. Download the application in PDF format and send the completed application to the address in the document. If you have any questions about any of these contests please contact the contest producer at Producer@LeatherColorado.org.